Put Power In Its Place…and Prevent Dangerous Restarts. Each year, thousands of injuries occur when an electrically powered tool or machine unexpectedly starts after a power interruption. This preventable hazard is caused when a tool’s switch is left “on” after a power outage, circuit breaker trip or accidental unplugging from the wall outlet. 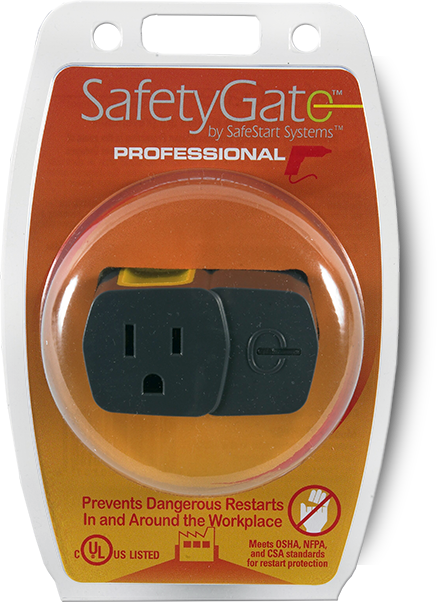 The revolutionary new SafetyGate™ Professional Retrofit is a simple, inexpensive, safety product that attaches to your tool’s power plug in seconds, providing anti-restart protection wherever and whenever you use it. SafetyGate™ works by recognizing when your tool’s power switch is left on and puts up a protective “gate,” stopping the flow of electricity. The bright yellow LED indicator tells you that your SafetyGate™ is in “protect mode.” To reset, simply turn your tool’s power switch to “off”. 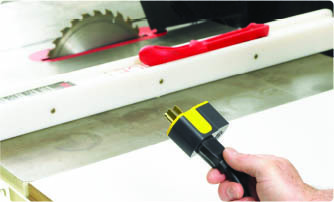 The Safety Gate™ Professional Retrofit becomes your tools’ new plug. It’s completely automatic! There are no buttons to push or switches to reset. It weighs less than 5.6g (2 oz) and two retrofits can be used in a standard wall outlet. The patented SafetyGate™ design complies with OSHA, NFPA and CSA standards* in eliminating the hazard of dangerous restarts. Now with SafeStart Systems’ miniaturization technology, owners of hand held tools and small machines can have the same safety anti-restart protection at a fraction of the cost of devices mandated for larger Industrial machinery. The Safety Gate™ Professional Retrofit is manufactured in the U.S.A. The SafetyGate™ Professional Retrofit becomes your tools new plug. The ingenious locking mechanism ensures the SafetyGate™ will remain securely attached preventing dangerous restarts at the source.